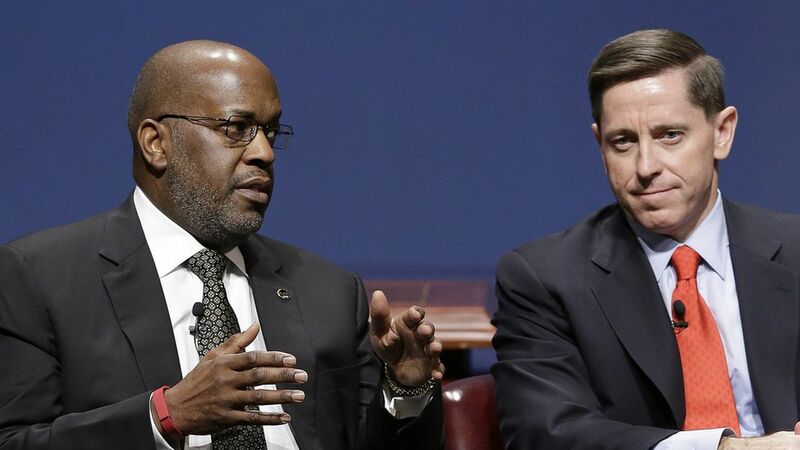 Kaiser Permanente CEO Bernard Tyson hopes his company can remain active in the Obamacare exchanges, but he also wants answers to what an Obamacare replacement will be. Kaiser Permanente is the largest organization that combines hospitals, doctors and health insurance under one roof, with more than $60 billion in annual revenue. Tyson was able to chat briefly about its $1.8 billion acquisition of Group Health Cooperative, which officially closed this week, as well as the health care policy environment. Here's an edited version of our conversation. We've spoken before, and you've said Kaiser Permanente is committed to the Affordable Care Act and its exchanges. What's your take on the current policy discussion? "It's my hope we'll still have a viable market that we'll build on and that we don't lose ground in the health care system that we've gained in the ACA. But what is unknown is where the new administration is going. That's the big question that all of us in the industry are anxious to know about and help in." So what does that mean for Kaiser's participation in the exchanges in 2018? "Our hope and commitment is to be there. What's not known is what is [the replacement plan]. And I'm hoping that can get answered pretty quickly in large part because I don't want our members or members of the ACA everywhere worrying about, 'Am I going to get coverage or not in 2018?' What I don't know is where the new administration is in helping to answer those questions." How did your acquisition target, Group Health Cooperative, which has a similar structure as Kaiser, fit with your Obamacare plans? "They were committed to the state of Washington, so they actively participated in the ACA. That is very consistent with the position Kaiser Permanente took. We participate and continue to participate in the ACA in each of the markets we're in." This deal will give Kaiser more than 11 million members. What's the broader rationale? "It's all part of our growth strategy. We have three parts to it. Grow in our core markets, continue to expand in the geographic areas around those core markets ... [and] grow into strategic new markets, which we have now successfully brought Group Health Cooperative under our umbrella. This now allows us to bring our value proposition to the state of Washington." Is Kaiser hungry for more deals? The was the first one in a long time. "We will continue to look for strategic opportunities ... But I want to emphasize this isn't just for the sake of growing members. It's really about showing the value of Kaiser Permanente." What about the concerns that deals like this lead to too much concentration in health care provider and insurance markets? "Our model thrives on proving you can make high-quality care accessible and affordable in the markets that we exist in. We're not big just to be big. We grew over time. We're keeping to our values."